KLC Chess team won 2 team champion, 1 team co-champion, 1 school champion, and 2 Individual Champion, 3 Individual Co-champion. Over 100 KLC chess players attended this biggest scholastic tournament of the year. Over 30 players ranked top 20 in different sections. Congratulation to all chess players. Chess is fun, Chess for world, Wisdom for life. ​Click here to see the result. King’s Land Chess is Northern California Tri-Valley based professional chess academy focuses on improving youth chess education. KLC offer professional chess training for youth players from beginner to master level, include group lessons, intensive chess camps, summer chess camps, private lessons, chess tournaments, and chess cultural exchange. We aim to develop successful chess kids who excel not only on the game, but in life. We dedicated our career to helping children to develop their critical thinking through chess and strengthen their mentality for the reality the children will face in their near future. Chess for World, Wisdom for Life. KLC offers intensive chess camps, summer camps, ​and international cultural exchange camps. Students will learn new chess knowledge and improve their overall chess skills. 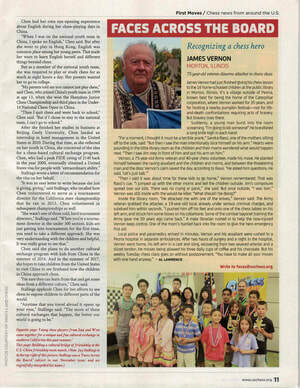 ​KLC is committed to promote chess cultural exchange and build the bridge for Chinese and American youth chess players. 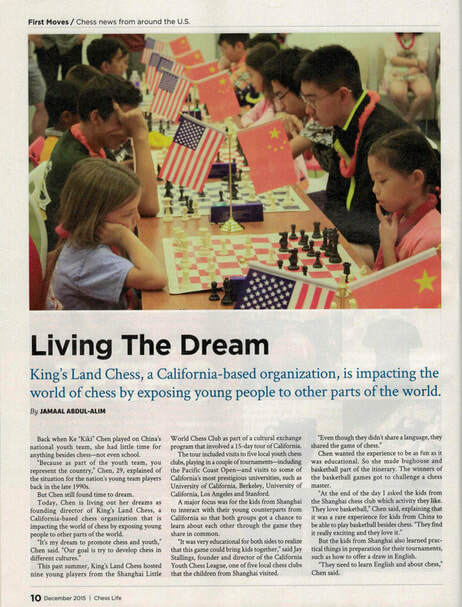 December 2015, US Chess Federation Official magazine - Chess Life post an article named Living The Dream about KLC chess cultural exchange program and Coach Kiki Chen on the first moves page. top 1 in the US Age 8 and under group. He will participate in 2018 and 2019 World Cadets Chess Championship U10 Section in Spain and China along with several other KLC students. Wish all players achieve good results. The 43rd CalChess Scholastic Super State Championship was held in Santa Clara convention center on 4/7 and 4/8. 2019 KLC Chess Summer Camps now open for registration! from June to July for the dates listed below. ​Camp will be instructed by World Chess Federation FIDE Trainer Kiki Chen and National Instructor Leo Liu. We offer full day camps and half day camps. We welcome any child of 5 to 16 years to attend the camp. The program includes Chess Rules, Chess Strategy, Chess Tactics, Bughouse Game, Simultaneous and Chess tournament. GM Bu Xiangzhi and FIDE Trainer Kiki Chen. Whole day camp is $799. Half day camp is $499. Fees include registration fee, materials, prizes, and snacks. Whole day camp includes lunch. ​Chess classes start throughout the year, students are welcome to join us any time.